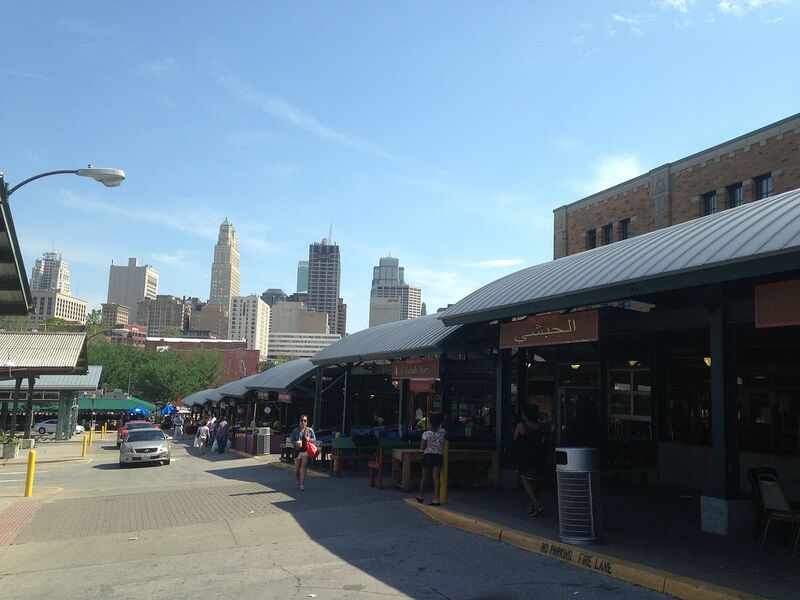 For the longest running farmer’s market in Kansas City, you go to the River Market, right off of Grand Avenue. 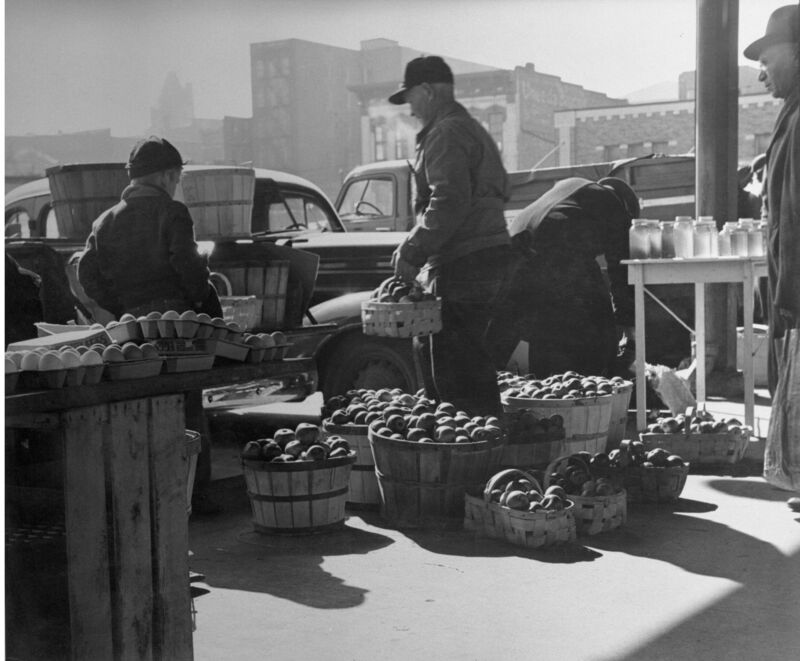 This photo from the 50s shows local farmers peddling local produce from local farms, in season. The food does not get any fresher than this unless you grow it in your own back yard. Today’s modern farmers are still making the trip every weekend day, rain or shine, to sell their food and avoid the middle man. You have to celebrate the brave farmer that is avoiding the corn and soybean production line. Trying to eke out a living during the spring and summer months without being able to count on Federal agriculture subsidies is a brave and dangerous path to take. It is probably much easier to put in and harvest corn and soy, and not have to worry at all about market prices, because the subsidy alone will keep you in business. This is just a small sample of what is going on at the market. Our day at the market involves browsing through table after table of open air flea market junk and antiques, filling our little red wagon up with tomatoes that are at the peak of ripeness, having just been picked in season. They don’t look perfect, but they have never been gassed to make them red. There might be blemishes and they will be odd shapes and sizes, but they taste exactly like the tomato of my youth. Local food is grown in local soil. The health of that soil makes the product, and that health is passed up the food chain to you. Without fertilizer, herbicides and pesticides to support them the grocery store produce would die on the vine. Your local produce is hearty, and can fend for itself. The things these foods create within them to defend them from disease and predations can be expected to defend you, too, when you consume them. Your body is evolved to expect certain things from you eating natural foods in season. So, how do you extend the shelf life of your fresh foods? Two ways, you can your fruits and vegetables, adding sugar as a preservative in the case of fruit, add vinegar in the case of vegetables, and you ferment everything else. Canning kills all of the bacteria and prevents rot, fermenting controls the rot, and makes sure that the bacteria that flourish are those that improve the food instead of spoiling it. I have written post after post on fermenting, search this blog for those articles, or read on next week as I go over canning and fermenting again. This is the season of bounty. 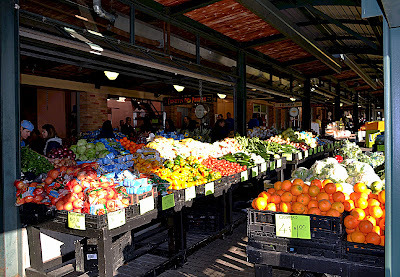 Now is the time to plan for a winter filled with healthy food packed away at the height of freshness. Eating the bounty of the harvest in the depths of winter can give your family something you can’t get at your local grocery store, eating trucked in fruits and vegetables from half a continent, or even half a world away. This entry was posted in Health, Living and tagged canning, farmer's market, fermenting, local food. Bookmark the permalink. Such a lovely perspective! You make these farmers sound like the heroes they really are.